What’s It About? The Parkers are a seemingly wholesome family, but patriarch Frank (Bill Sage) rules over them with a rigorous fervour. When tragedy strikes the family, his daughters Iris (Ambyr Childers) and Rose (Julia Garner) are forced to assume responsibilities that extend beyond those of a regular family. The small town local authorities begin to uncover clues to the horrible truth about the Parkers – something that has been hidden for many years. Verdict: Remaking/re-imagining a horror film nearly always see’s the new version fall away compared to the original, and it’s especially tough when the original was so well received by critics and horror aficionados. 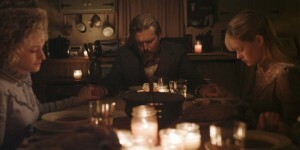 Yet director Jim Mickle (responsible for the disturbing Stake Land) has taken on the challenge of remaking the Mexican movie Somos lo que hay in English, moving it from the Inner City of Mexico to a sleepy town in the American deep south. Aesthetically, Mickle doesn’t seem to have changed much from the original film; rather he has garnered an entirely new movie from the same subject matter, in part due to the absolutely stellar performances from the lead cast. Both Childers and Garner are subdued and reserved for vast amounts of time, seemingly still wet behind the ears in their childhood years. It’s only when they need to become the heads of the house that we see an almighty change in their demeanours as they become strong, confident women, even at such a tender age. Yet it’s Bill Sage, as dad Frank Parker, who holds the most tension in his performance. A slow, menacing beast of a man who voices very little but rather the terror seeps from his eye contact with those who displease him. When he does rise to strike, it fills the screen with peril and sheer trepidation. This remake doesn’t go down the more blood/shocks is better route, instead it stays within its boundaries, creating a simmering tension that’s racked up another notch with every key scene. You can feel the mental and emotion strain take hold of the characters (and the viewer), making it unbearable. But when the eruption happens, it spills out with a raw unadulterated emotion that will leave you nauseated even after the credits begin to roll. The final scene is one of the most demanding of the movie, a full-on grizzly shocker of meaty portions. Extras: A thoroughly insightful Making Of featurette entitled “An Acquired Taste” that’s all filmed on set, rolling around between takes and grabbing brief interviews with those involved. An especially enjoyable moment is where Bill Sage talks about bringing his own dog to the set and into the movie. Pretty standard one-shot interviews with most of the cast and crew. An interesting and fun audio commentary with writer-director Jim Mickle, actor Bill Sage, co-writer Nick Damici, actor Julia Garner and cinematographer Ryan Samul. Mickle does most of the talking and the others weigh in occasionally. Final Words: We Are What We Are is the perfect example of a gothic story set in the southern states of America. Brimming with terror and merciless performances, this is one remake that easily stands up next to the original. With religious overtones and esoteric undertones creating a genuinely frightening movie. We Are What We Are is out on DVD now. Why not check out our interview with We Are What We Are director Jim Mickle & writer Nick Damici about their latest movie Cold In July?